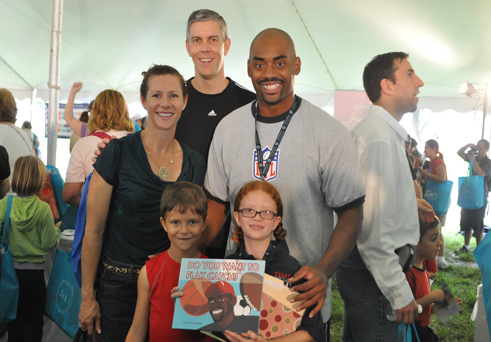 Last month former NFL Linebacker and children’s book author Chris Draft visited IMLS at the National Book Festival Pavilion of the States. Chris Draft has participated in Let’s Read/Let’s Move events and through his foundation supports a variety of family literacy and healthy lifestyle initiatives. The following questions and answers highlight his perspective about the value of libraries and the benefits of reading and staying active. Tell us about some of your partnership activities with Let’s Read. Let’s Move. My foundation has partnered with the Corporation for National and Community Service’s United We Serve Let’s Read/Let’s Move initiative to encourage Americans to address summer reading loss and childhood obesity. The past two years I have been invited to joinSecretary of Education Arne Duncan during the Department of Education’s Let’s Read/ Let’s Move summer series. The agency is a partner for the campaign and their series brings together public figures to read children’s books and promote healthy lifestyles. I had the opportunity to read my children’s book, Do You Want to Play Catch, to the youth, answer some very thought-provoking questions, and engage the youth in some vigorous exercise. This summer we extended the reach of the campaign by having several events throughout the country encouraging youth to stay active in reading and exercise. Although the program currently focuses on the summer months, the goal is to extend activities year-round. We know that you are a big fan of library cards. What advice do you have for new library card holders? Use it! If you don’t a have a library card you should get one today. I remember how happy I was when I got my first library card at the Anaheim Central Library. I will always remember the moment shared with my mom and older brother that sparked my love for reading. Libraries have something for everyone and if you can’t decide what to read, the librarian can help by providing suggestions about books, reading programs, music, games, and other resources and services for children, families and adults. Libraries are MORE THAN JUST BOOKS! How can busy families find time for reading and fitness? As an athlete I know the importance of adopting a lifestyle of staying fit mentally and physically. During my 13 year NFL career, we routinely spent more time in the classroom than practicing on the football field. Yet, I also understand that finding time for reading 30 minutes and playing 60 minutes each day can sometimes be a challenge. There are many activities that can fit into busy schedules. How about a jog or brisk walk to the school bus or reading while waiting at appointments? Just try. Every bit counts. Keep it fun and be sure to include extended family, friends, and neighbors. About Let’s Read. Let’s Move. The Let’s Read. Let’s Move. initiative seeks to combat childhood obesity and summer reading loss by engaging youth in summer reading and physical activity, as well as by providing access to healthy, affordable food. The initiative is an Administration-wide effort led by the Corporation for National and Community Service in collaboration with First Lady Michelle Obama’s Let’s Move! and four other federal agencies: U.S. Department of Education, Department of Interior, Department of Health and Human Services, and Department of Agriculture. Chris Draft is the Founder, President and CEO of the Chris Draft Family Foundation. The Foundation focuses on seven primary initiatives with overarching themes that stress the importance of education, healthy lifestyles, character development, personal responsibility, self-discipline and physical fitness. As a Former NFL player, he continues to be active with the NFL and in the community, serving as a NFL Ambassador. View the article at UpNext here.